In this debut picture book, various cats do some decidedly un-catlike things. Seven cats in seven basic colors—red, orange, yellow, green, blue, purple, and brown—engage in seven different activities: they whistle, dance, fly, paint, skate, cook, and read, as shown in the accompanying illustrations. A mouse companion who appears on many pages might be considered an additional color or colors: dark and light gray. For each endeavor, on the next page an unconvinced cat and mouse ask “Really?” in a way that invites children to join in. Finally, Mansfield’s tale asks: “Can CATS ‘Really’ do these things?” The forthright answer from a laughing mouse is “Not Really!” Lester and Carpenter’s illustrations depict each stunt faithfully enough—although the purple cat is eating, not cooking—and sometimes add whimsical details. For example, the green artist cat sports a beret and paints a portrait of the mouse, sitting on a wedge of cheese. The flying yellow feline wears a superhero cape and goggles, while the mouse holds onto the cat’s head for dear life. The back-and-forth rhythm of statement, question, and answer works well here as a read-aloud book for small children, who can join in asking “Really?” It’s easy to imagine the fun of drawing that word out with as much skepticism as possible. The absurdity of seeing cats fly, dance, and so on should also amuse preschoolers (children ages 2 to 5 are the target audience). It’s a big drawback, though, that the pictures don’t hold much appeal beyond their colorful nature and the silly acts they illustrate. Throughout, the drawing looks amateurish and flat, with awkward limbs and little expression. 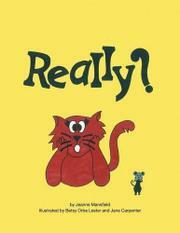 The recurring “Really?” image is exactly the same except for changing the kitty’s color on each occasion. The cats aren’t very catlike, with their big, humanlike eyes, and their bodies produce no impression of feline qualities like furriness or litheness. The mouse is the more engaging character when the cats should be the stars. This feline tale offers some entertainment and educational value but lacks inventive illustrations.